A free guide on how to make investment banking pitchbooks. What is an investment banking pitch book? 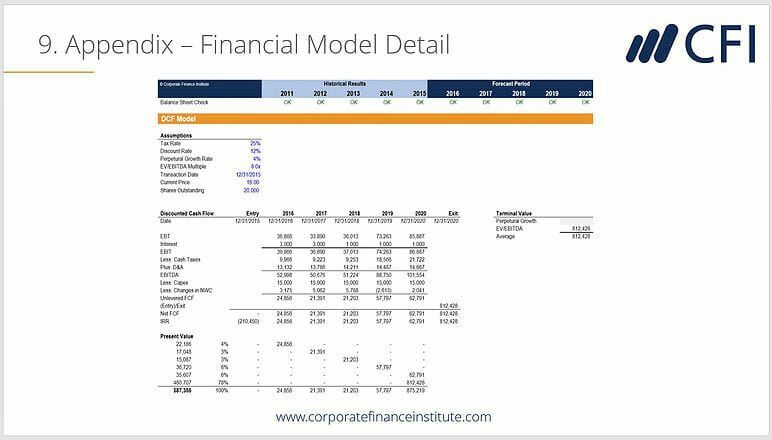 An investment banking pitch book is a PowerPoint presentation designed to win new business. The “pitch” is typically an explanation of why the bank in question is best suited to lead the transaction, and why they should be engaged by the client. There are various types of pitches, and depending on the relationship with the client and the type of traction they can vary widely. What’s included in an investment banking pitch book? 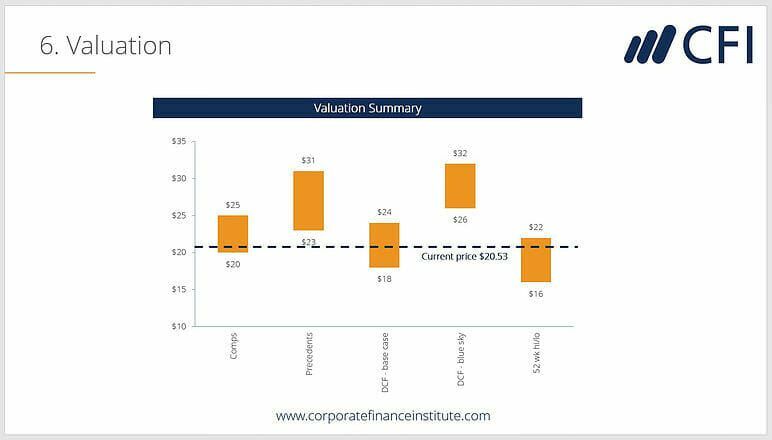 Valuation – valuation methodsValuation MethodsWhen valuing a company as a going concern there are three main valuation methods used: DCF analysis, comparable companies, and precedent transactions. 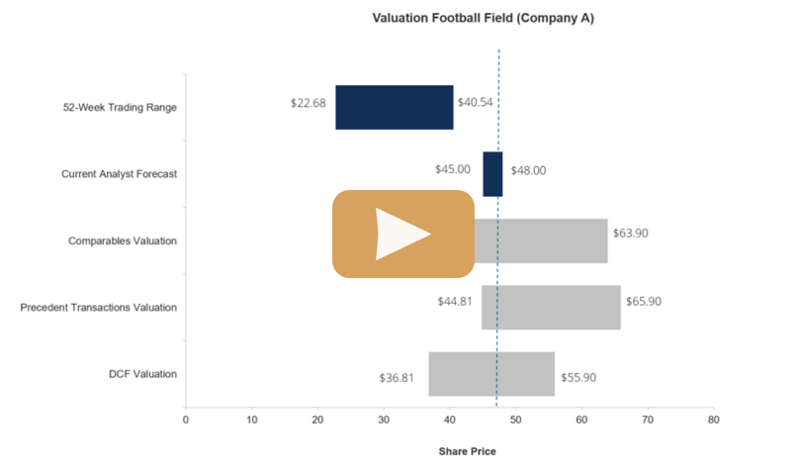 These methods of valuation are used in investment banking, equity research, private equity, corporate development, mergers & acquisitions, leveraged buyouts and finance include: comparable company analysis, precedent transactions and DCF analysis (if enough information has been provided to perform one) all displayed in a football field graphFootball Field Chart TemplateA football field chart is used to display a range of values for a business. Download our FREE Excel football field chart template and learn how to make one. How is the pitch book actually made? The pitch book is a collaboration between junior and senior bankers, with most of the actual work being done by investment banking analysts and associatesInvestment Banking Career PathInvestment banking career guide - plan your IB career path. Learn about investment banking salaries, how to get hired, and what to do after a career in IB. The investment banking division (IBD) helps governments, corporations, and institutions raise capital and complete mergers and acquisitions (M&A). Analysts work 100. Typically, a managing director (who has a relationship with the client) will sit down with a director or VP to create an outline of the pitch book. Then the VP or director will wireframe the structure of the pitch and have the associate work with the analyst to crunch all the numbers and create all the analysis used to populate the presentation. The process can take anywhere from a couple of days to a few weeks, depending on the client’s timeline, and how busy the team is. The process usually requires a high number of iterations with many drafts or version of the pitch, often late at night and over the weekend. How is the pitch delivered? In most cases, the pitch book is delivered in person at the bank’s or corporate client’s office by senior members of the investment banking team. The managing director with a relationship with the client will typically lead the meeting, and other bankers may have smaller roles as well. If junior members of the team like analysts or associates attend they usually don’t say anything and take note or are prepared to dig up any additional information that’s required. Whether you’re looking to get hired, or move up the ladder, we’ve got all the resources you need for a successful career in investment banking.